Ethiopian Red Cross workers carry a body bag with the remains of Ethiopian Airlines Flight ET 302 plane crash victims at the scene of a plane crash, near the town of Bishoftu, southeast of Addis Ababa, Ethiopia March 12, 2019. REUTERS/Baz Ratner. American company Boeing, the world’s biggest manufacturer of airplanes, hopes its best-selling Boeing 737 MAX will soon return to the skies. Airline companies and flight safety officials around the world ordered the 737 MAX grounded after two of the planes crashed. On Wednesday, new information was released about the minutes leading up to the crash of a Lion Air passenger jet last October. The jet came down in the Java Sea shortly after leaving Jakarta, Indonesia’s capital. 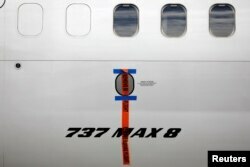 The Reuters news agency says the new information appears to show the plane had a serious flaw. Experts believe the plane’s automated system may have forced the nose of the aircraft downward. They said this appears to have caused both the Lion Air crash and the crash of an Ethiopian Airlines jet on March 10. The automated system attempts to prevent the plane from stalling on takeoff. Flight safety experts say neither crash investigation is complete. They add that actions of crew members and their training will also be looked at closely. At Boeing’s headquarters in Chicago, Illinois, officials have promised to quickly release a new version of computer software for the 737 MAX. However, officials in Europe and Canada will want to test it themselves, instead of depending only on U.S. approval. For nine minutes, the jet warned pilots it was in a stall and pushed the nose down, the report showed. The captain fought to climb, but the automated system continued to push the nose down. Investigators examining the Indonesian crash want to know how and why a computer ordered the plane to dive. They believe it was because of a sensor that did not work correctly. They also want to know if pilots had enough training to control the jet. Boeing has said there is a documented way for dealing with the problem. It also said the pilot and co-pilot are supposed to understand the process. A different crew on the same plane the night before had the same problem, but solved it after running through three checklists. Bloomberg reported that the crew members got help from an off-duty pilot, who was on the same flight. The crew members apparently did not explain the problem or its solution to the next crew, investigators found. Those findings were released in November. Boeing must wait for several investigations before the 737 MAX can return to the sky. In the past, Europe and Canada would have accepted the findings of the U.S. Federal Aviation Administration (FAA). Now they will seek their own answers. “Our credibility as leaders in aviation is being damaged,” wrote Chesley Sullenberger. He is the American pilot who became famous 10 years ago after landing a jet on the Hudson River, saving all 155 people on the plane. Aviation officials want to be sure of Boeing’s new automated control system. They also need to know that pilots are fully trained and prepared to deal with problems. The FAA said its “robust processes” and its cooperation “with the aviation community” were important to safety worldwide. In Ethiopia, experts were examining the in-flight recording of the captain and first officer of the Ethiopian Airlines flight . As with the Indonesia flight, they radioed control problems shortly after takeoff and asked to turn back. They struggled to get their plane up before it hit the ground. However, experts say every accident is a mix of human and technical events. For now, more than 350 MAX aircraft are grounded worldwide. Boeing’s plans to sell nearly 5,000 others are on hold.